This is Day 1 in a series. You might want to start at the introduction. You may not be aware, but it turns out that I watch quite a bit of anime. And if you want to watch legal streaming anime, you're going to end up at Crunchyroll eventually, as I did. I'm not fully sure what the exact circumstances were, but one day in Fall 2013 I was probably really bored, and decided that I'd click on the "Drama" tab on Crunchyroll. That happened to be when Mischievous Kiss: Love in Tokyo was airing, and Crunchyroll had somehow managed to get the simulcast rights for it, so they were promoting it fairly heavily. I thought "Eh, why not?" and checked it out, thus sealing my fate. 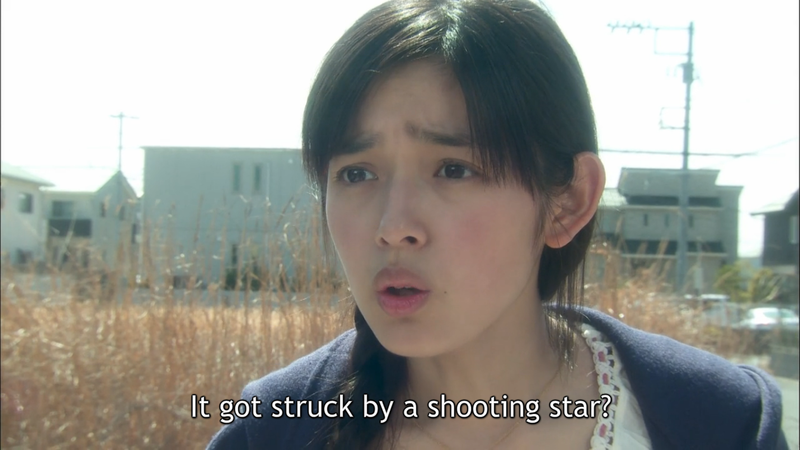 I have to say, Mischievous Kiss is a pretty great J-drama to start with. It can be really cheesy at times, in the best possible way, which is something that I've found is often the case with these dramas. There's a lot of overacting and hamming it up, and the costume design is glorious (though not the most insane of the J-dramas I'll be covering). It's fairly typical for a J-drama comedy, so if you watch it and end up enjoying it, you'll definitely like what else is out there. To clarify my previous statement, a J-drama does not mean that a show is necessarily dramatic; it just means that it is live action. Our main characters, Irie Naoki and Aihara Kotoko. The story of Mischievous Kiss actually comes from a famous manga of the same name (though it's usually referred to by its Japanese name, Itazura na Kiss). The reason for the manga's fame is rather unfortunate though: the author Kaoru Tada died before she could finish the manga. However, the series has still been very popular, and has been adapted into an older J-drama, an anime, a Taiwanese drama, and a K-drama in addition to this J-drama, though Mischievous Kiss: Love in Tokyo is the most recent one. Although the manga was never finished, the author did leave story notes behind, so the adaptions have done their best to interpret the notes into the intended ending. The setup of the story is fairly straightforward, if slightly ridiculous (that's probably a word that I'll be saying quite a bit this week). Aihara Kotoko is in high school, and has a crush on the smartest boy in the school, Irie Naoki. Unfortunately for her, she is not smart at all, so when she tells him how she feels, he completely blows her off. Then, to make a bad day worse, a meteor suddenly hits her house, destroying it completely. Her dad decides to move them in with his old college friend, who happens to be Naoki's father. Naturally, with Kotoko and Naoki now living together, hijinks ensue. That's just the setup though. All of that happens in the first episode, and the story really builds from there. One of the best parts of this story is how it takes place over many years, not just the few in high school like so many romances do. Unfortunately, this is also one of the weaknesses of the show, because they don't handle the characters aging very well. The main actors look pretty much the same no matter how old they're supposed to be. Well, except for one of the main actors, who is swapped for an older actor at one point, which is even more jarring because this one character has suddenly drastically aged, even though no one else around them has. It's unfortunate, but if I'm going to be honest, I don't know that they could really have handled it any better. Kotoko is a pretty typical airhead main heroine: she's not smart and has a one-track mind, but she's also amazingly loyal. She's played by Miki Honoka, who does a fantastic job acting the ditz. One thing that's always confused me about her is that the other characters act like she's an ugly girl, but I just can't see it. Naoki, on the other hand, is an emotionless robot with a mean tongue most of the time. He's played by Yuki Furukawa, who pulls of the cold-hearted jerk quite well. Thankfully, he does grow up a bit throughout the series, but very gradually. Actually, the actor grew up in Canada for many years, so I'm biased to like him. Naturally, this means he speaks good English, which lends some credibility to the idea that Naoki is a genius at everything. I agree Kotoko. That is the correct face to make in that situation. One of the recurring gags is how, no matter where he goes, Naoki is the smartest one there, and all of the women immediately fall in love with him, without fail. At one point, one of the other male characters complains to Naoki that he has a harem, and you know what? He's right. The number of women that chase after him and try to get his attention is ridiculous (I said it again). Yes, he's smart, and yes, he's attractive, but he's also a jerk most of the time. Doesn't that count for anything? I guess not. Season 1 lasted for 16 episodes and ended last spring. This past fall, Season 2 started, picking up right where the first one ended. There are some pretty major cast shakeups between seasons, which helps breath some new life into the show. It's not a shakeup where the actors are changed, but one where the characters that are focused on change. Some of the most important characters from Season 1 are barely seen at all in the second season, and a whole gamut of new characters are added in. And honestly, that's probably the only realistic part of this show. As time goes on, the people around you change. Everyone gets busy with their own lives, and friends see each other less and less often. As of today, 15 episodes of Season 2 have been aired, so it's right at the end. And this isn't just another season break; this will be the end of the series. I'll definitely be sad to see it go. Yes, it may be unbelievable and ridiculous, but it's also a whole lot of fun. The show has made me laugh so many times, and I appreciate it for that, but really it's the characters that have grown on me. The characters are what makes this show, cheese and all. Both seasons of Mischievous Kiss are available from Crunchyroll for legal streaming in North America currently, with Season 1 available worldwide except for some of Asia, and Season 2 available worldwide except for some of Asia in the next few months.